During Indian Online Seller’s (IOS) survey for the 30-day return policy story, a seller shared that he has suffered huge losses because the ecommerce courier partners lack empathy and the returned goods from buyers reach him in an unsalable condition. He is thinking about quitting online selling until delivery agents and buyers learn how to handle returns. Online seller Shashank Agarwal, based in Bhubaneswar, Odisha shares the same sentiment. If marketplaces’ policies, undercutting strategies and indifferent attitude weren’t enough, the behaviour of their logistics partners is equally inexcusable, if not more. Delivery partners of ecommerce companies are not only contributing to sellers’ losses, but are also pushing them away from the online selling world. Shashank, a mobile accessories vendor has been selling online since 2014. He reached out to IOS with a sole intention – warn the seller community about ecommerce-focused logistics player Ecom Express and make them aware of the unethical practices followed by delivery partners of online marketplaces. He has lost around Rs. 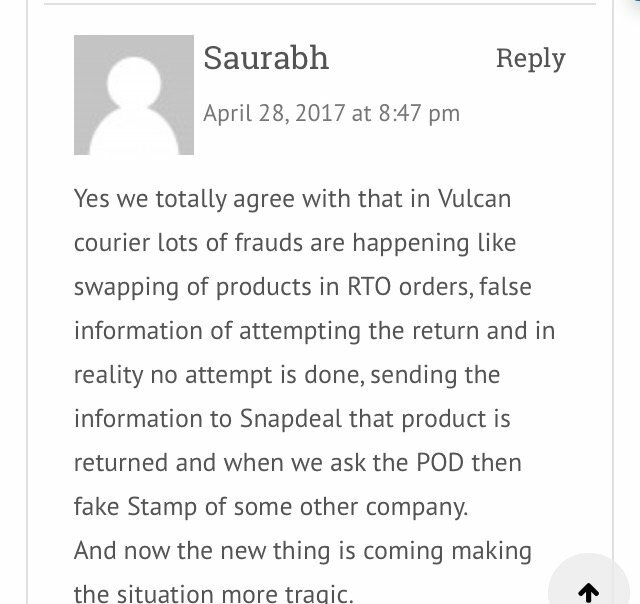 45,000 (approximately 700 orders RTO for Ecom Express) while selling on Snapdeal and has given up on recovering that money. But he wants other vendors to learn from his experience. Especially, when the 2017 festive sales are just around the corner. 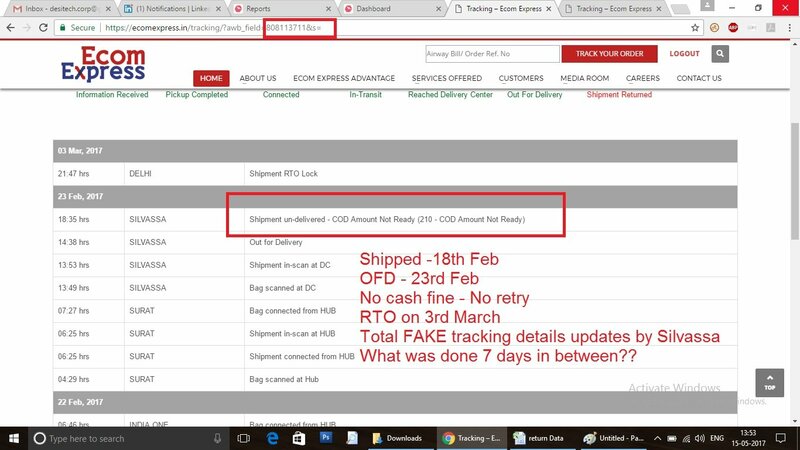 The main issues that the seller faced with Ecom Express were that the seller: a) delayed deliveries which led to high returns and b) uploading wrong tracking details. Each RTO costs him about a loss of Rs. 60, plus an additional Rs. 15 as packaging cost. Due to the logistic company’s bad service, the seller had to shut down one of his seller accounts on Snapdeal because of high RTO during 2016 Diwali sale. “I had reported this issue to Ecom after last year’s Diwali sale. I had run an ad campaign on Snapdeal to get more orders during sale period. And we got huge orders. Also our payment cycle was reduced from 10+7 to 3+3,” shares Shashank, while speaking to IOS. IOS has reviewed the proofs shared by the seller, including the tracking page screenshots and email sent to Ecom Express by the seller highlighting the issues. But the company has not yet responded to the seller. Snapdeal assigned Ecom to the seller and didn’t give him an option to change the service provider. Snapdeal’s system automatically selects the delivery partner for a vendor. Shashank has also used FedEx and Bluedart’s service for self ship model on his own website and Paytm. He says that it takes maximum 3-4 days for the product to get delivered and that too with lower shipping charges than Ecom Express. “During sales, sellers invest on ad campaigns, take loans to procure huge stocks, packing material etc. Also drop the selling prices. We also feel good that we are now getting 100-200 orders per day. But what’s the use of getting orders if delivery person cannot deliver it? Delivery companies are not prepared well. Their staff report false statements saying consignee refused, upload fake tracking updates, send products as direct RTOs without attempting delivery,” he adds. Be it Amazon’s ATS or Snapdeal’s Vulcan Express, pretty much all courier companies are contributing to sellers’ woes. As a seller: Although ATS have a very good performance track record, they have also misbehaved on certain occasions. There have been cases where the courier partners have missed the delivery timeline and reported in their device “customer not available” and the package goes back to the marketplace after 3 unsuccessful attempts. The customer is still waiting for their package to arrive, but they get an email saying that the package is returned as the customer is not available. Being a seller, sometimes the marketplace reimburses the delivery fee if the customer rejects or customer not available, and sometimes they don’t. But the seller still suffers a loss of the stationery and the shipping labels and the time and efforts put in that package. As a buyer: I am a seller and a customer of amazon.in. 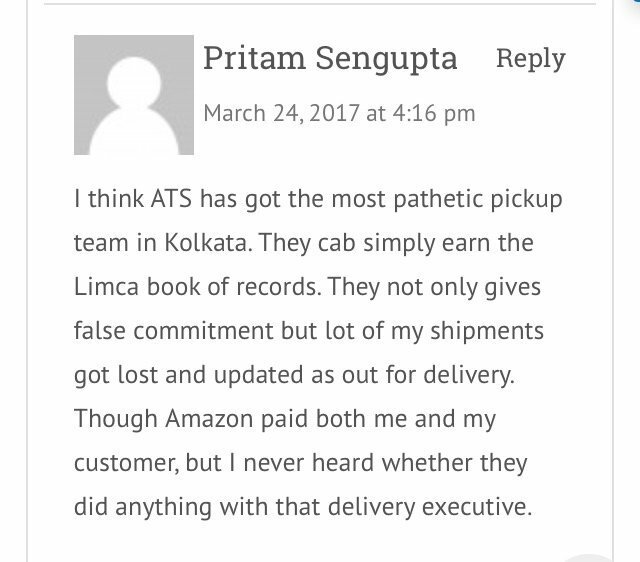 So the challenges faced by me, being a customer also give me an idea as to how the sellers are facing problems because of this mishap caused by ATS. Sometimes the ATS people call the customers and inform them that the lane you’re located is very crowded and our vehicle can’t come there. And if the customer can’t come to pick it up themselves, they will put a reason “customer not available” because if they put any other reason in their system, then they will be punished. Seasoned sellers say that 70% of all ecommerce frauds are committed by courier firms and 30% by customers. That’s why sellers face a tough time to get claims and still lose their money. “Who is to be blamed for this? Marketplaces have policies in place to not listen to sellers and say “its buyer choice to cancel or return”. But the culprit is courier companies, who on the other hand are earning double by forward shipping as well as reverse RTO charges. Sellers make all the efforts to get orders shipped the same day of the order. And finally the reward is – negative settlement of that order,” dejectedly avers Shashank. Since big ecommerce players have in-house delivery partners, they should allow customers to open and check packages during delivery. If the customer is not happy with the product, then the order can be cancelled/returned, there and then. IOS thinks that online marketplaces should hold their logistics partners accountable for their actions and penalize them accordingly. The need for accountability holds paramount importance. 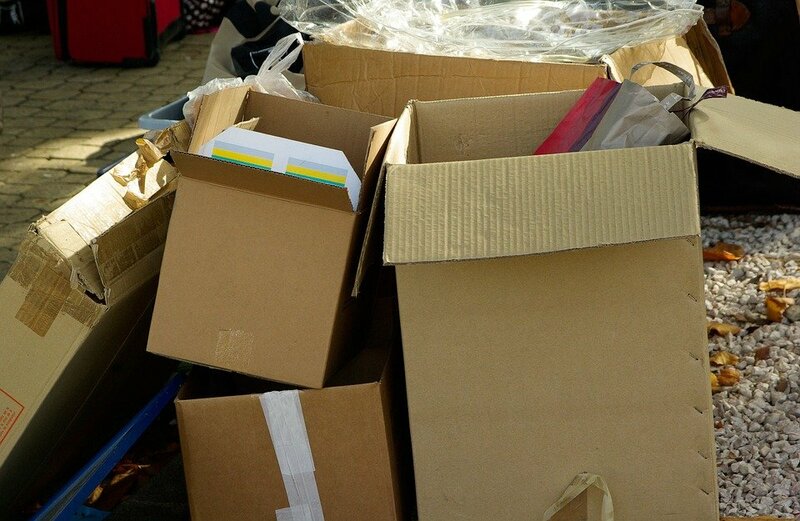 Sellers, would you like to share your suggestions to reduce RTOs and frauds committed by courier companies? Let us know through your comments.